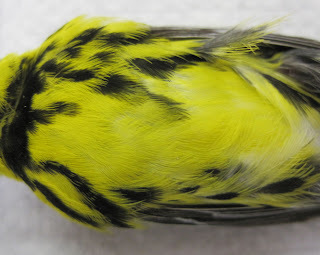 Last week when I went in for my regular volunteer shift in the bird division at the Field Museum, Dave had taken out four Magnolia warblers from the freezer for me to work on. The warblers, like just about everything that I work on, were window kills that had been collected back in May and the beginning of June. I spent the morning making study skins of them that would go in to the collections. Magnolia warblers are extremely beautiful little birds in the family Parulidae. This group that I worked on was probably headed for nesting grounds in the boreal forest up north. The males, as you can see from the photo, have a bright yellow breast, heavily streaked with black. Each bird that finds its way to the collections is given a number, and all sorts of information about that specific specimen is recorded on its tag that is tied around one leg: when the bird was collected, where, whether it is male or female, size of its gonads, body fat, was it molting, ossification of the skull (if it is a passerine), if a tissue sample was taken, and the name of the person that prepared the specimen. There are other details that are recorded that I have not listed, but the previous are the ones I am responsible for writing down on the labels. So in the case of the above specimen: it was found and brought to the museum on June 1, 2009, it had a trace amount of body fat, it's a male that had testes a size typical for the breeding season, a tissue sample was taken (and was frozen in a little tube with the same number that is on the tag, S09-1030), the skull was 100% ossified (indicating it was a mature bird), and no signs of molting were noticed and recorded. What are study skins? These posts are always wonderful. Hi J! If you check out the link "about bird collections in museums" in the links column "natural history..." to the right, that should give you an idea.